Tue., 26 Nov. - Thu., 12 Dec. Thu., 26 Dec. - Fri., 10 Jan. Mon., 10 Feb. - Tue., 18 Feb. 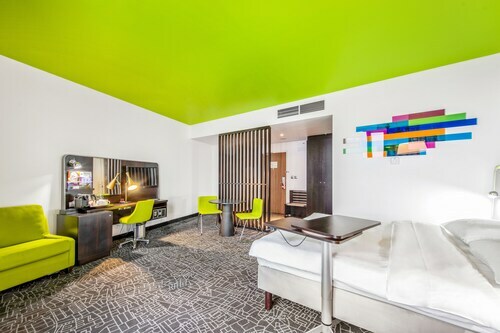 Located in Vsevolozhsky District, this eco-friendly hotel is 5.6 mi (8.9 km) from Expoforum and within 25 mi (40 km) of State Hermitage Museum and Winter Palace and Peterhof Palace and Garden. Located in Vsevolozhsky District, this hotel is 2.4 mi (3.9 km) from Victory Square and within 9 mi (15 km) of Catherine Palace and Park in Tsarskoye Selo and Saint-Petersburg Sports and Concert Complex. Grand Maket Russia Interactive Museum and Alexander Palace are also within 9 mi (15 km). 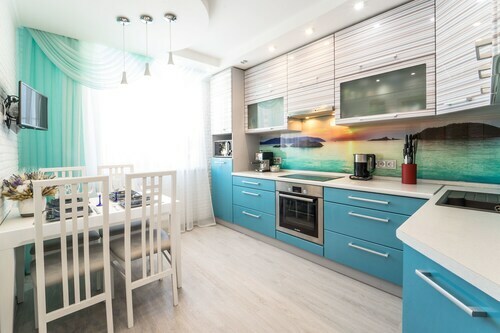 Located in Vsevolozhsky District, this apartment building is 1.4 mi (2.2 km) from Victory Square and within 6 mi (10 km) of Saint Petersburg Sports and Concert Complex and Grand Maket Russia Interactive Museum. Moscow Triumphal Gate and Saint Petersburg State Puppet Fairytale Theater are also within 6 mi (10 km). Located in Vsevolozhsky District, this eco-friendly hotel is 0.1 mi (0.1 km) from Victory Square and 2.4 mi (3.8 km) from Saint-Petersburg Sports and Concert Complex. Grand Maket Russia Interactive Museum and Moscow Triumphal Gate are also within 6 mi (10 km). Moskovskaya Station is 18 minutes by foot and Zvyozdnaya Station is 30 minutes. 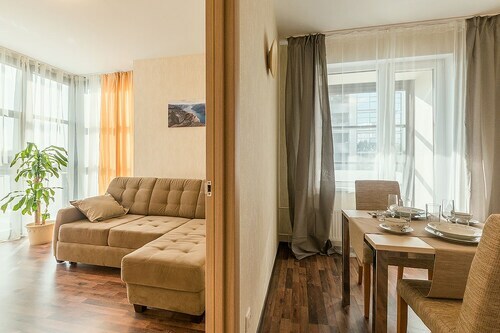 Located in Vsevolozhsky District, this aparthotel is 0.3 mi (0.4 km) from Victory Square and 3 mi (4.8 km) from Saint Petersburg Sports and Concert Complex. Grand Maket Russia Interactive Museum and Moscow Triumphal Gate are also within 6 mi (10 km). Zvyozdnaya Station is 21 minutes by foot. Located in Vsevolozhsky District, this aparthotel is 0.2 mi (0.4 km) from Victory Square and 2.9 mi (4.7 km) from Saint Petersburg Sports and Concert Complex. Grand Maket Russia Interactive Museum and Moscow Triumphal Gate are also within 6 mi (10 km). Zvyozdnaya Station is 21 minutes by foot. Located in Vsevolozhsky District, this aparthotel is within 9 mi (15 km) of St. Isaac's Cathedral, Kazan Cathedral, and Palace Square. Church of the Savior on Spilled Blood and Catherine Palace and Park in Tsarskoye Selo are also within 12 mi (20 km). Zvyozdnaya Station is 26 minutes by foot. Located in Vsevolozhsky District, this aparthotel is 0.2 mi (0.3 km) from Victory Square and 3 mi (4.8 km) from Saint-Petersburg Sports and Concert Complex. Grand Maket Russia Interactive Museum and Moscow Triumphal Gate are also within 6 mi (10 km). Zvyozdnaya Station is 26 minutes by foot. Question : How much is a plane ticket to Saint Petersburg (LED) from Vancouver (YVR)? Answer : Cost can range anywhere from $1,072 to $5,591, prices for YVR to LED do fluctuate much more than the majority of routes from Canada. Prices are usually less the further out you book. Answer : The cheapest day to fly from Vancouver to Saint Petersburg is on Wednesday. So, if you are trying to save some money on your next holiday look for flights on that day. Question : What airports do you fly into for Saint Petersburg? Answer : Departing from Vancouver International Airport isn't the only way to get to Pulkovo Airport. Try looking for flights from Victoria International Airport (YYJ). Over the next two months, flights from YYJ to LED are being booked 38% cheaper than flights from YVR to LED. Being 40 miles away from Vancouver International Airport. Answer : Yes, you can change your departure or arrival date. If you wish to save some funds in doing so, the lowest-cost day to fly in April is Wednesday. Being flexible with your travel days can provide you extra savings when booking. Question : What is the cheapest airline flying from Vancouver to Saint Petersburg? Answer : Finnair is offering the best deal at $1,072. Better grab that deal quickly because prices range all the way up to $5,591 over the next three months. Question : How long do most people stay on their visit to Saint Petersburg on average?